Does The Most Valuable Customer Engagement Professional Play on YOUR Team? INDIANAPOLIS, IN (October 24, 2018) – World Series Champs? NFL MVP? CustomerCount® and Resort Trades magazine have their own competition going. The annual 2018 CustomerCount® Customer Engagement Professional (CEP) Resort Trades Award recognizes outstanding leaders who exemplify the best in customer engagement practices. 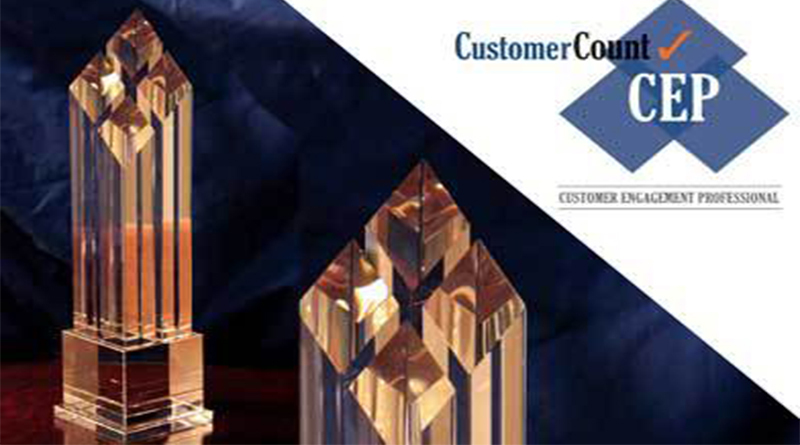 Nominations for CustomerCount® Customer Engagement Professional Resort Trades Award opened in September. Nominations will be open until December 2, 2018. The winner and the winning company will be announced in January. CustomerCount and Resort Trades are looking for the most valuable customer engagement professional within the timeshare resort/hospitality industry. Qualified people most likely will be resort managers, assistant managers, front desk folks and customer service team members who are in daily contact with members and guests. online feedback system which measures and reports customer feedback through branded, customized online surveys. “Our system can be utilized in numerous ways–including an efficient method in determining a winner for this award,” said Robert Kobek, president of CustomerCount. The winning customer engagement professional and their company/resort will be profiled in the January issue of Resort Trades. Two trophies will be presented; one for the company and one for the individual CEP. To submit a nomination, visit CustomerCount or Resort Trades for a link to the entry form. Or fill out the online form. CustomerCount is a feature-rich, cloud-based survey solution providing intuitive real-time reporting, fast turnaround on requested updates, and detailed and dynamic data gathering capabilities to support process improvement efforts, build customer loyalty and improve your bottom line. Developed and managed by Mobius Vendor Partners, CustomerCount was initially designed for the timeshare and contact center industries and is now used by organizations across numerous different vertical markets and industries. For more information, visit www.customercount.com or call 317-816-6000. Follow them at http://www.customercount.com/blog/ on Twitter @CustomerCount or facebook.com/CustomerCount.